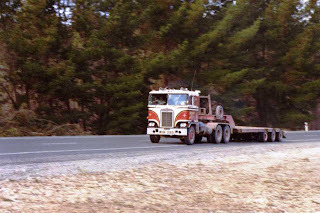 Cab-over engine, forward control, flat front...call them what you like, but Kenworths of this model are always an impressive sight. 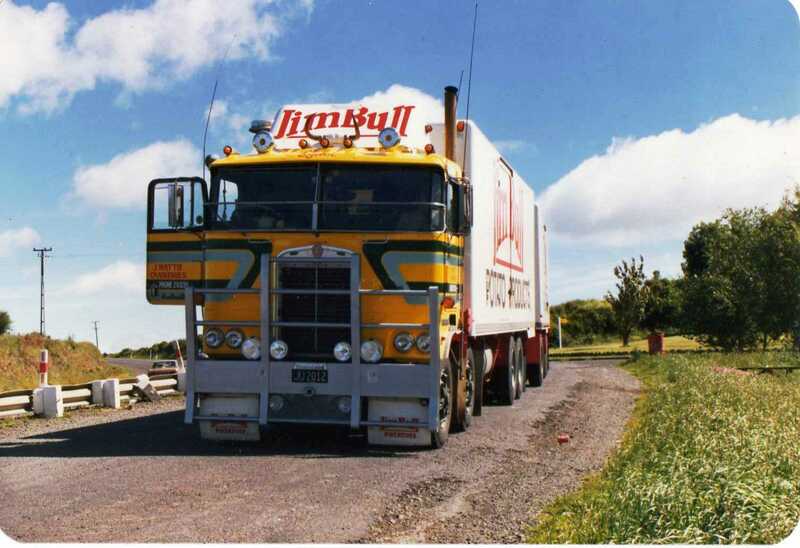 Although their cabs all look similar there are in fact many variations and changes as this model has progreessed from when they first arrived in NZ around the mid 70s. Earliest examples had a narrow grille and small headlamps like this example with low-loader powering along State Highway 1 in the central North Island. 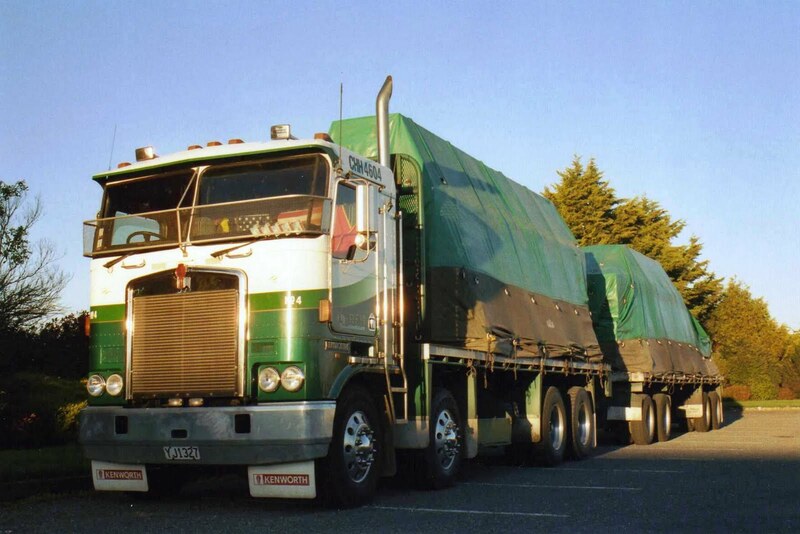 Later models were developed in Australia and had a wider grille to let air into bigger radiators for bigger engines. They also had larger headlamps which I believe were unique to Australian models. 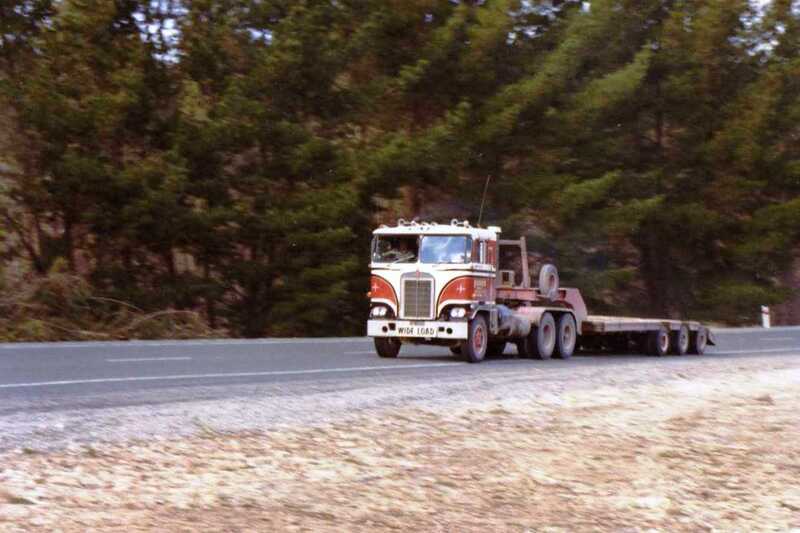 Note also the shaped front bumper in contrast to the straight one on the earlier type. This one blows a trail of exhaust smoke as the driver floors the throttle after using the "Jake-brake" coming into the corner. 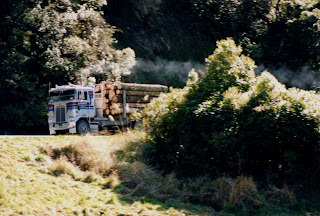 This straight bumper, small headlamp model unloads fuel in Pahiatua. A large headlamp model in Trailways livery tops up the tanks at Faulknor's Service station in Masterton. 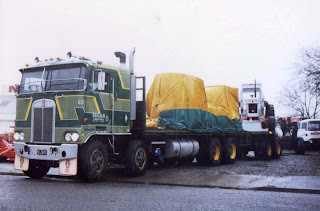 A Regan Haulage 8 wheeler with sleeper cab unloads a tractor at C.B Norwood in Masterton. 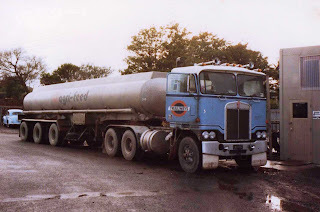 Norwoods are tractor and agricultural machinery dealers. J.Watties Canaries operated this 8 wheeler with trailer seen here stopped near Bombay, South of Auckland. Watties are a major NZ producer of canned and frozen foods. 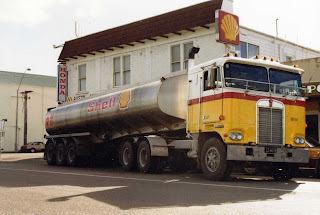 The Jim Bull signage is the name of a range of potato chips (french fries) produced by Watties. One of the first Aerodyne cabbed models in NZ was this B-train pulling rig operated by Combined Haulage, seen here in the main street of Taupo in the central North Island. 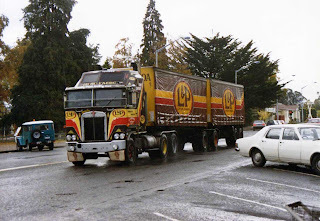 L&P is a favourite NZ soft drink. Later still the headlamps became rectangular as can be seen on this 1993 K100E aerodyne in Freightlines colours. 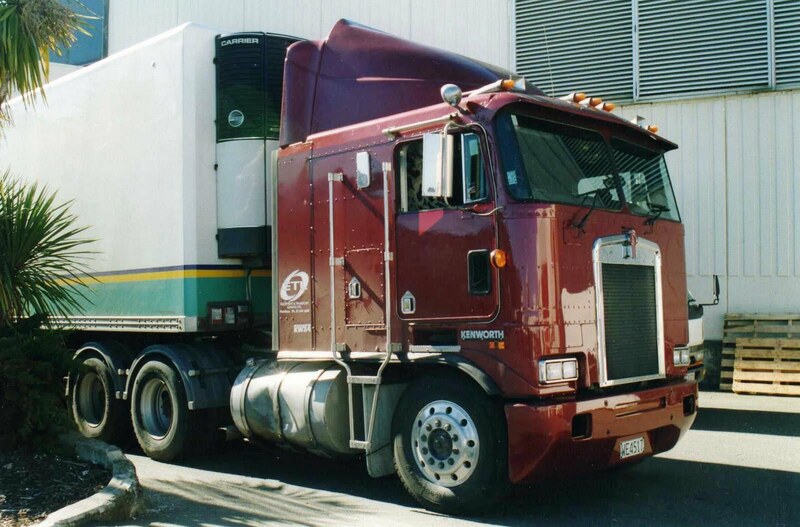 This aerodyne cab is a later model than the above as can be seen by the different shape along the upper edge. The front bumper is now aerodynamically shaped. This is a 1999 model operated by A.S.Wilcox of Pukekohe parked outside a motel in Masterton. This example also has a very wide grille presumably to cool a very high horse-power motor. 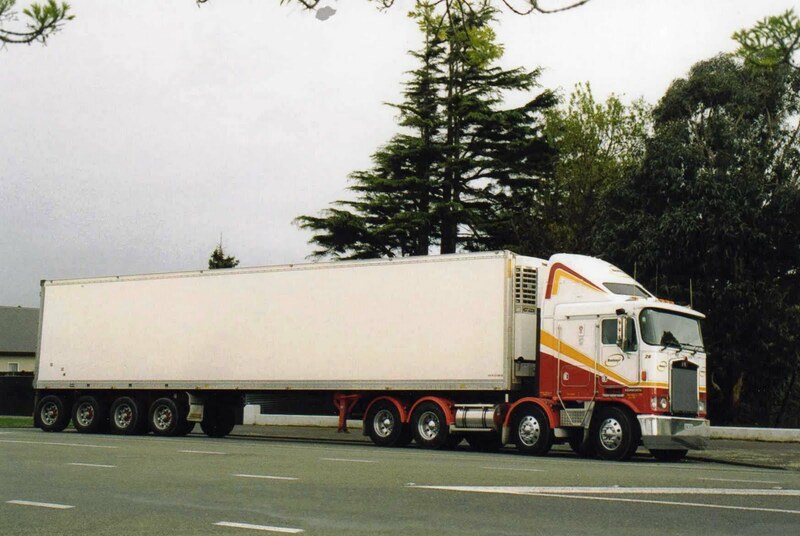 Notice also that the windows in the doors now have dip at the bottom toward the front and the windscreen is now a curved one piece item with three wipers..
Rectangular headlamps, smooth front bumper, flat top cab and grille not as wide as the above and a divided windscreen. This is a 1992 registered K100 of Equipment and Leasing Ltd unloading a refrigerated semi-trailer at Foodtown supermarket in Lower Hutt. 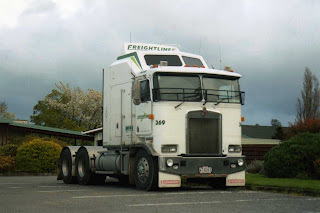 Rectangular headlamps were not popular with K model traditionalists, so in late 1999 they reverted to round once more, but this example still has the 4 piece windscreen and an aluminium front bumper. 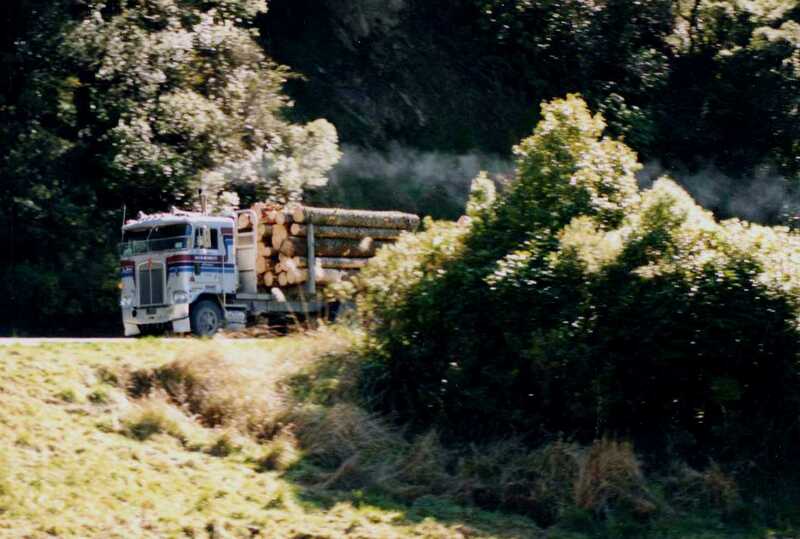 It is operated by Rotorua Forest Haulage. 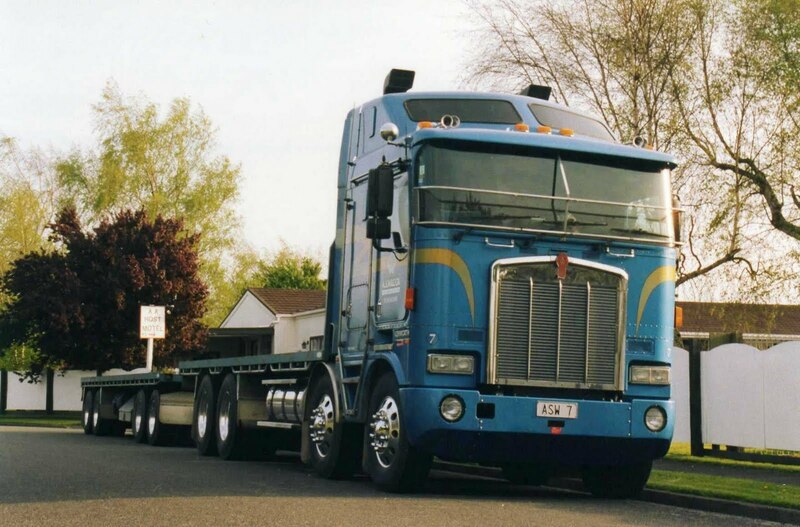 Photographed in Palmerston North this model has a wind deflector on top which blends in perfectly with the aerodyne cab. It also has fairings over the headlamps and the one piece curved windscreen. 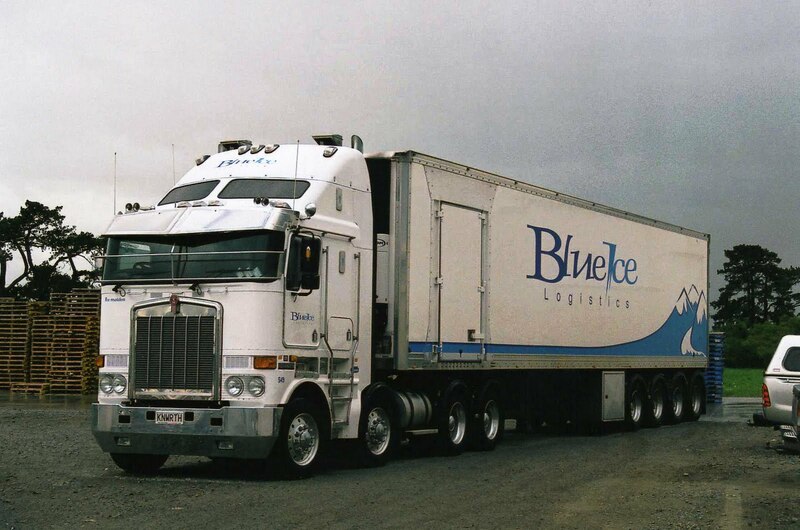 Almost identical in layout to the above; this 2008 K108 with Blue Ice logistics markings is waiting at Premier Bacon Company in Carterton to be loaded with bacon, ham and smallgoods for the trip to Auckland's supermarkets. The large stainless sunvisor and stone guard gives it a sinister appearance. These 4 axle trailers have the two rear-most axles self tracking, with automatic centralising and locking when reverse is engaged. 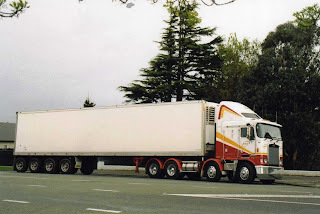 Alternatively they may have the first and last axle of the group self tracking, but the above option is more common. Although this is a 2008 model, I notice it has a divided windscreen with only 2 wipers. Maybe this was an option. 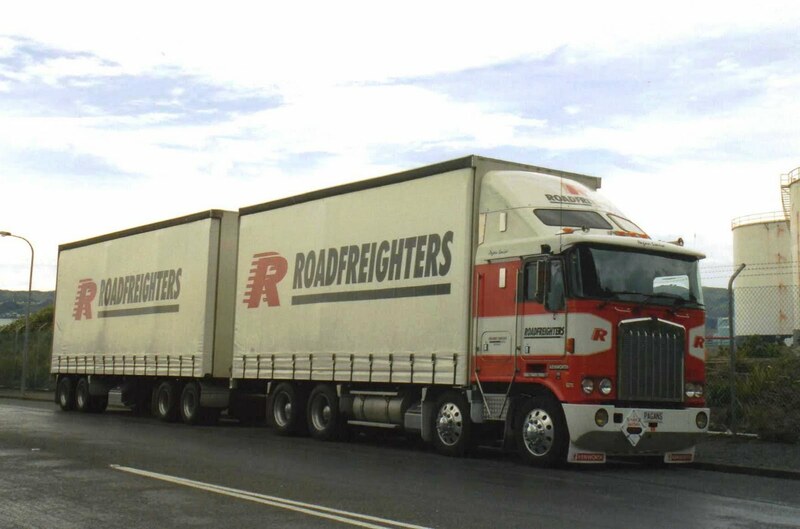 Rapid Roadfreighters 2000 K104 with curtained sided B-train with the curved windscreen and smooth front bumper. 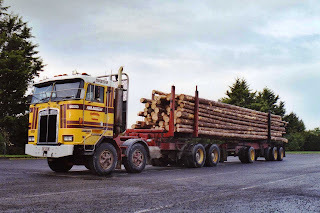 Some 8 wheelers in the rectangular headlamp era had the front axles rear set as on this K140ER operated by Rob Dahm of Tokoroa.